The Matrix was the first film I ever really wrote about. At university, I produced an A-grade essay on the editing of the government lobby shoot-out scene – an essay I’d sorely love to read today. Sadly, it was produced back in the day when such pieces were still produced with pen and ink - the paper copy has not survived the interceding years. Thinking back to those days, it’s almost impossible to believe that mobile phones and home internet were uncommon. Despite that, The Matrix has not dated at all, rooted as it is in a world of technology and special effects which were revolutionary at the time – but remain influential and impressive today. 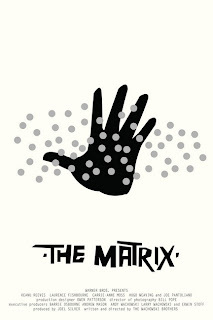 Even the memory of the inferior sequels cannot sully The Matrix’s reputation. Morpheus (Laurence Fishburne) eventually makes contact with Anderson (better known as Neo) and reveals the truth: the world he knows is a construct designed by an artificial intelligence which has enslaved mankind in order to farm their bio-electrical energy. Suspended in an amniotic gloop, their brains are plugged into The Matrix and kept alive by piping virtual reality representations of a world which long ago ceased to exist directly into their cerebrums. Morpheus’ band of rebels is mankind’s last stand – representatives from the last human city of Zion waging a desperate battle against the machines to preserve the future of man. 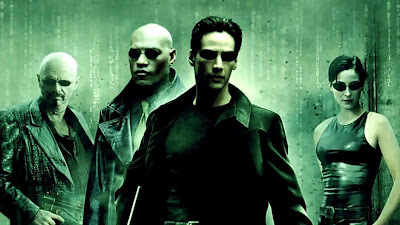 They literally unplug Neo from The Matrix thanks to Morpheus’ unshakeable belief that he is ‘the one’ – a messianic figure who can rescue the human race from their virtual purgatory. But perhaps Morpheus’ faith is misplaced? The Matrix is magnificent – the greatest sci-fi film since the similarly grungy Blade Runner. But it’s not merely a derivative tribute to Ridley Scott’s classic. Instead, it adds layer upon layer of ideas and tropes rarely seen in the genre: spiritual meditations, kung-fu, punk fashion and numerous literary and religious references. These elements are not thrown into the mix at the expense of more traditional science fiction. Rather, The Matrix utilises new camera techniques and styles, creates a number of distinct worlds in which its action takes place and melds human bodies with alien technology in truly horrifying fashion. Whether the Wachowskis invented or merely popularised ‘bullet time’ technology is hotly debated. Certainly they were the first to bring it to a mass audience. And how. The fight scenes in this film are some of the finest ever filmed. Key cast members spent four months in martial arts training prior to filming and it shows. Allied to their undoubted skills and some spectacular choreography, the ‘bullet time’ technique elevates the battles here well above the average, creating spectacular camera angles, sweeps and stunts never before possible. The technique sees dozens of cameras filming the same object from various angles. Cut and spliced together, it’s possible to edit these different frames into one continuous flow, around which the cameras seem to move. The effect is evident from the opening scene in which a leather-clad Trinity (Carrie Ann Moss) leaps in the air and kicks a policeman in the chest. As she hangs frozen, the camera seems to sweep 360 degrees around her before she lands her killer blow. ‘Bullet time’ has gone on to be used in dozens of subsequent movies, but has never been used as effectively, and with such impact, as here – not least in an iconic scene of slo-mo bullet dodging. People have rightly lauded Christopher Nolan for bringing brains back to blockbusters with the likes of The Dark Knight and Inception, but the Wachowskis got there first. The Matrix is a densely plotted and philosophical film full of big questions and bigger action sequences, featuring an ensemble cast at the top of their respective games. Sadly the duo never quite lived up to their promise. Let’s hope that their next picture, the densely plotted, big budget Cloud Atlas can recapture the cinematic promise they showed in this groundbreaking genre classic.